For many of us, Labor Day weekend marks the end of the summer months. I’m happy to report that Kenny and I made the absolute best of summer this year. 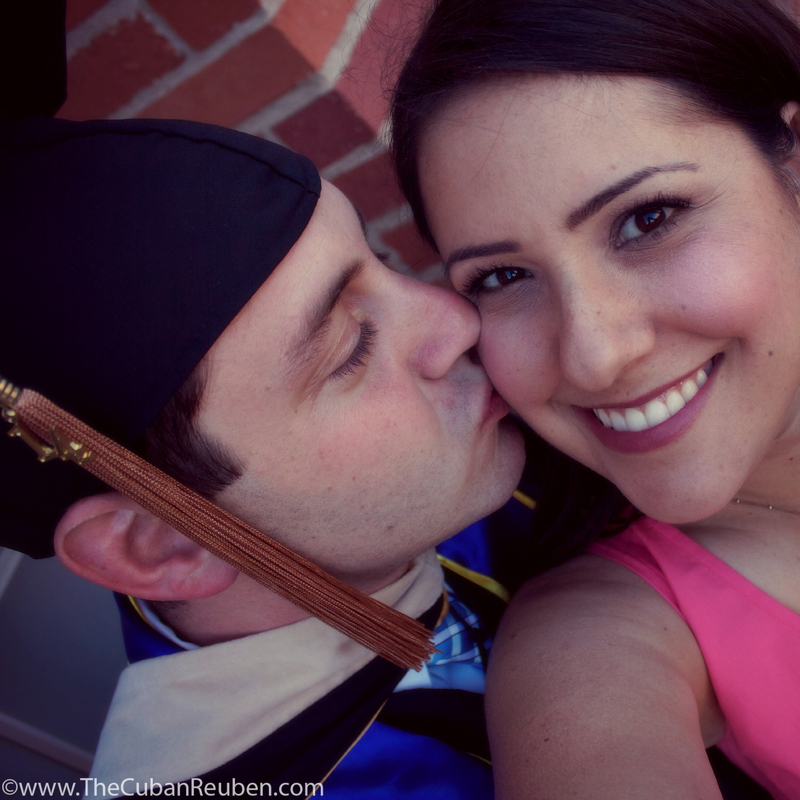 For us, summer really began in May, when Kenny graduated from business school after three long years of working during the day and studying at night. I definitely earned this post-graduation moment right here. We started by visiting Kenny’s parents in his hometown of Columbus, OH, where we ate our weight in Graeter’s ice cream, and experienced a true Midwestern fourth of July celebration. From there, we ventured to Indianapolis, IN to welcome our family’s newest addition to the tribe, baby Esther Rose Stempel. Kenny and I soaked up the time with our nephews and niece as best we could, because we don’t get to see them very often. 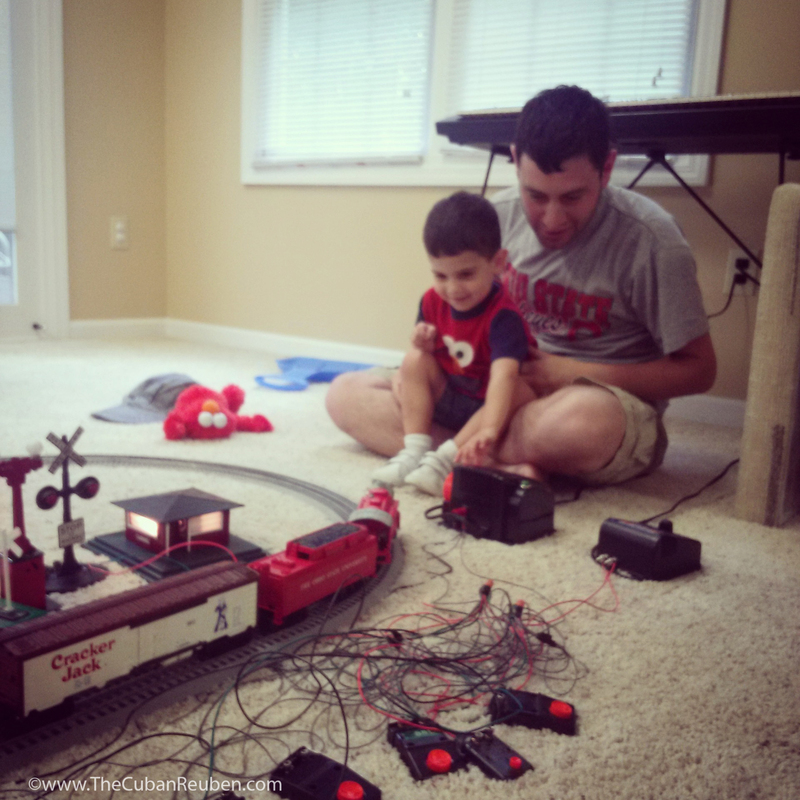 Uncle Ken shows Eli how to make the trains run. There may be another engineer in the family, soon! We enjoyed pizza parties, pasta-making parties, bachelor parties, and more parties than I think our geriatric selves have experienced in our lifetime. A particular highlight was “Pizza and Path” at the Saly Cortile Cucina, hosted by Matt and Dana Saly. They invited a fabulous group of their friends to enjoy a night of fresh pizza and fine tunes by an old favorite of mine, Joshua Path (aka, Josh Bloomberg). We shared memories of old camp days and even sang some of the songs we remembered, while Josh introduced me to some of his newer melodies. 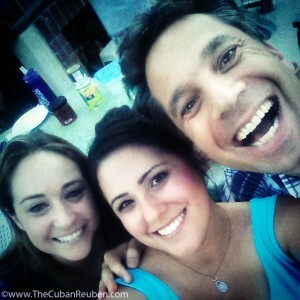 Dena Zelig and I huddle up with our fave rocker, Joshua Path. He’s even better than I remembered! And what’s a summer with Kenny Stempel without a little fishing? In early August, Kenny and I joined our extended family for a memorable fishing trip in Mammoth Lakes, CA. 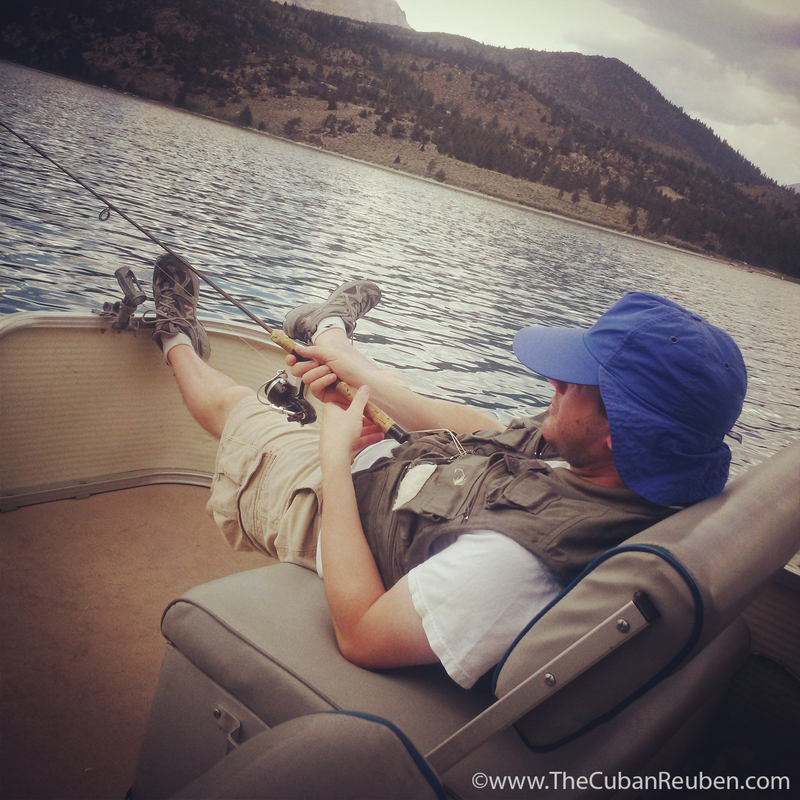 We hit up June Lake and Convict Lake, and had a wonderful time relaxing on the pontoon while we caught some trout. He doesn’t get more relaxed than this! One of Summer’s greatest highlights for Kenny was the fishing trip he took with my dad to Alaska. Similarly to the trip that Kenny and my dad took a couple years ago, this year’s trip produced a freezer full of fish I barely know what to do with. This time around, in addition to the loads of salmon, Kenny gifted me with another prized catch, as well: fresh Alaskan halibut. Despite my disdain for all things fishy fish, this is actually good news, as halibut really does have a relatively mild flavor, which of course, makes it easier for me to enjoy my intake of omega-3’s. The colorful display of tacos. The moment Kenny walked through the door with loads of this freshly caught fish, I went to work dreaming up a recipe that aims to please. 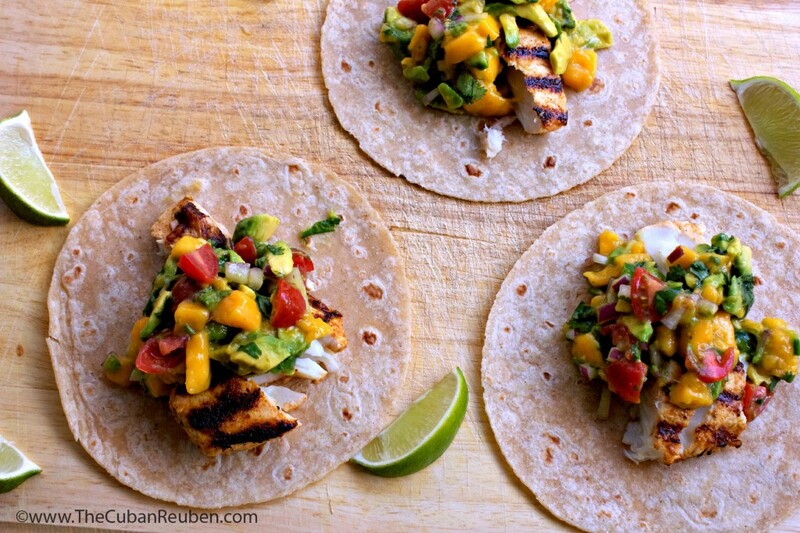 I created a citrus-heavy marinade for the fish that is balanced perfectly with the sweet and savory mango avocado salsa that decorates the top of the taco, and makes for one ridiculous bite-ful of goodness. I can’t think of a better way to keep the summer going than by whipping up this recipe that, simply put, tasted like summer. 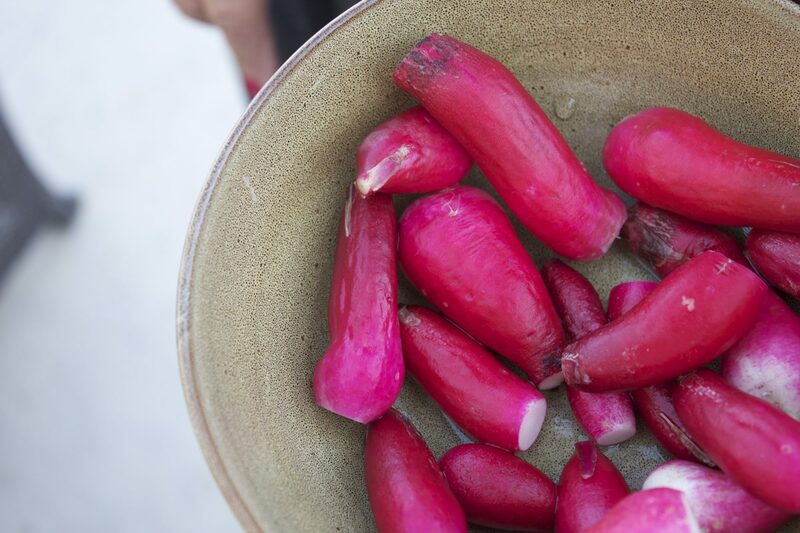 No matter the time of year, one bite from these babies, and you’ll be right back smack in the middle of your own favorite summer memory, too. 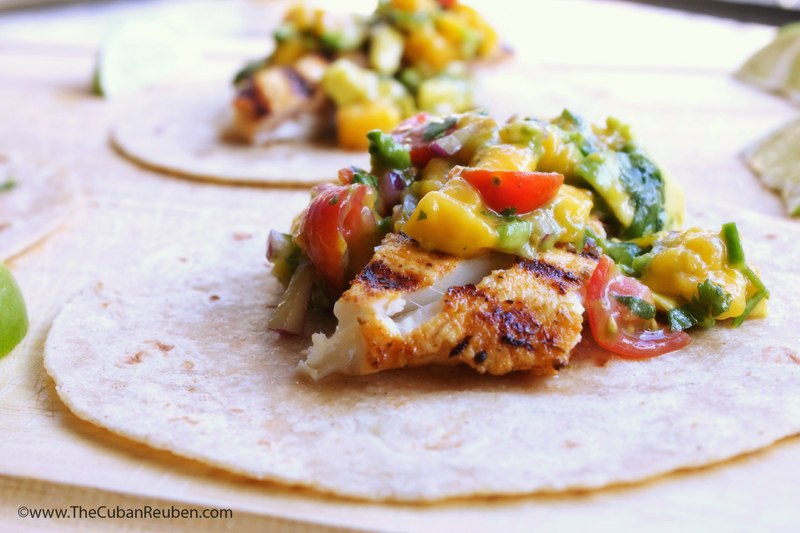 The savory flavors of this grilled fish pair perfectly with the sweet fruit salsa. In a plastic bag, add fish, lime zest, lime juice, garlic, onion powder, paprika, chili powder, cumin, salt and pepper, and olive oil. Tightly seal bag, and massage the fish until all ingredients are combined. Store in the refrigerator, and marinate for 20 minutes. Meanwhile, in a large bowl, gently fold together mango, avocado, red onion, cilantro, jalapeno, tomatoes, lime zest, lime juice, salt and pepper, and set aside. Heat an indoor grill pan to medium high heat, and drizzle with olive oil. Cook halibut 3-5 minutes per side, or until flaky. Warm tortillas according to package instructions. Fill each tortilla with flakes of fish, top with salsa, garnish with lime wedges, and serve immediately. With such a passion for cooking, I am often asked what a typical meal in my house looks like, and where I find inspiration for my daily dishes. As I’ve said before, during the work week, if it takes longer than thirty minutes to prepare, I’m not interested. Spoiled by the Southern California sunshine, oftentimes this means firing up the grill for some marinated chicken and vegetables. Of course, there are only so many different marinades for chicken, and once in a while, I have a hankering for something different. Recently, while pondering what to make for dinner that night, I spotted a facebook post from my fellow foodie, Noah, who I met producing student theatre for the Jewish Theater Ensemble at Northwestern many moons ago. So inspired by his plate of shrimp, pasta, and salad, I set out to recreate my own version, and headed to the market on my lunch break for the ingredients. The moment I got home from work, I threw the shrimp in the oven, pulled together a simple salad, and prepared an herbaceous and aromatic salsa cruda for the pasta that was boiling in the pot of salty water. Once the pasta reached perfect al dente texture a few minutes later, I added it to the bowl of the salsa cruda, which perfectly warmed the sauce, and dinner was on the table in no time flat. Of course, I had to share a photo with Noah, the man who inspired it all. With his emphatic thumbs up, I now had a new recipe to add to my weekday repertoire. I look forward to the day Noah comes to visit and together we can cook the dish he inspired. 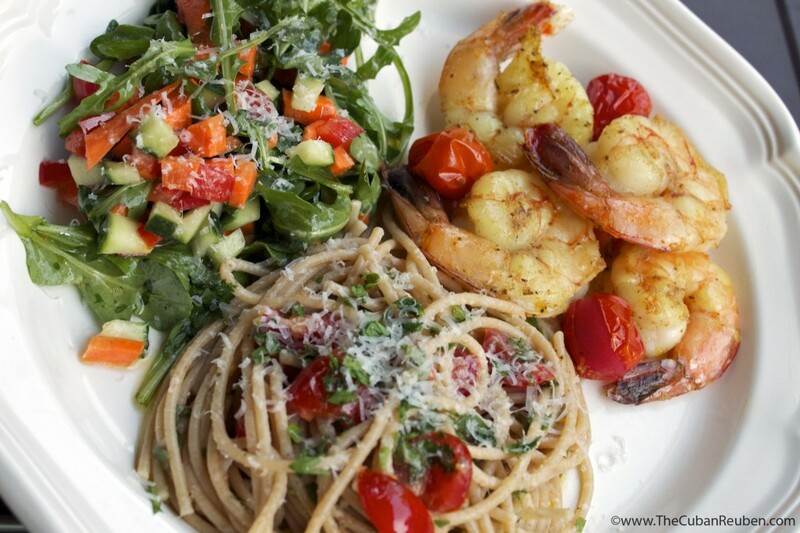 Until then, our virtual tag-team cooking will do the trick…especially if it means more delicious dishes like this one! 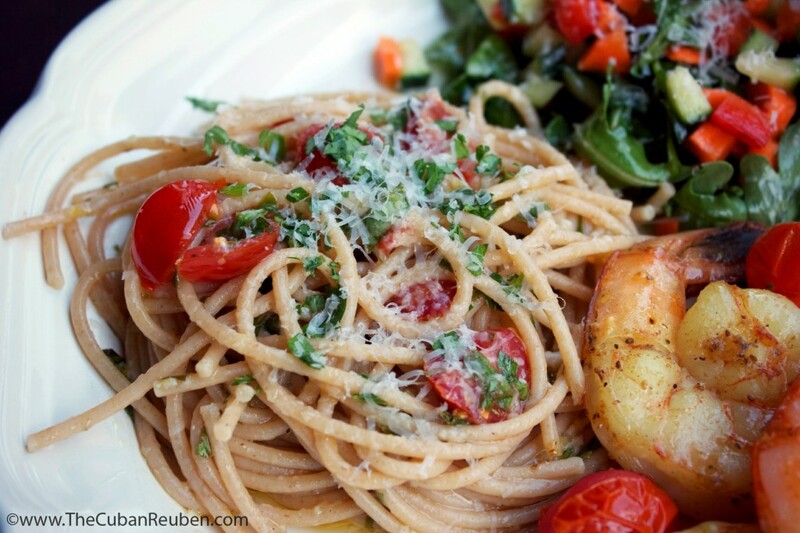 A quick, fresh, Summery dish that is perfect for dinner for two. In a large pot of salted boiling water, cook spaghetti according to the directions on the package, or until pasta is al dente. In a separate bowl, combine the juice and zest of the lemon, garlic, parsley, basil, tomatoes, olive oil, salt and pepper, and stir to combine. Once pasta is cooked to al dente, reserve 1 cup of the pasta water, and drain the pasta. Add to the bowl with the salsa cruda, and use kitchen tongs to incorporate the sauce into the pasta. If needed, add 1 tablespoon of the pasta water at a time to the sauce. Top with freshly grated parmesan, and serve.